The interactive dashboard on Italian government bonds, updated to 31 May 2018, has been published on the PBO’s website. This provides a detailed analysis of the characteristics of outstanding domestic government securities and the main debt indicators (composition, rates and average maturities). Using this information, the Parliamentary Budget Office has developed a model for forecasting and analysing interest expenditure on public debt which makes it possible to estimate the impact of the main factors affecting its dynamics (rates, composition of issues, requirements). On the basis of the projections of the dynamics of public debt securities estimated using the PBO model and historical data, it is possible to outline a scenario of the refinancing needs of domestic government securities in the two-year period 2018 – 2019, given the trend forecasts of public finance and the rates contained in the DEF (Economic and Financial Document) 2018, and consistent with the expected prospects of the ECB’s Quantitative Easing. In 2018 and 2019, the italian Treasury will need to sell approximately 380 billion euro of securities, 35 billion euro less than in 2017 (approximately -9%). A downward trend that began in 2014; in 2018 this amount is expected to be 100 billion lower than it was in 2013, despite the significant increase in securities issued (+250 billion since 2013). This result is primarily linked to the increase in the average time to maturity (ATM) of securities, which allows a lower refinancing frequency. The lengthening of debt maturities is a historical objective of the Treasury. The ATM was 3.3 years in 1993, increased to 5.8 in 2000 and 7.1 in 2010. A virtuous path interrupted by the crisis: from 2010 to 2014 the ATM was reduced by about a year. The increase in interest rates in 2010-2011 induced the Treasury to issue more short-term securities to limit the impact of the spreads on the average long-term debt rate (and also to reduce the market’s absorption of long-term maturities). The Treasury began to increase the maturities of new issues again from 2013, when the pressure on interest rates eased. 2017 was the third consecutive year of increase in the ATM, but the figure is still below the level of 2010 (6.8 years compared to 7.1). In 2016, the peak in the ATM of new issues was due to the introduction of new 20- and 50-year bonds. Since 2015 debt refinancing has undoubtedly been facilitated by the ECB’s purchases of securities on the secondary market. As the QE¹ slows down, the market will have to absorb larger shares of securities: in 2016, the ECB bought around 45% of the new medium- and long-term issues on the secondary market. In 2018 this share will fall to 24% and in 2019 to 9.5%. (¹) For 2018, a slowdown in the QE is assumed, with purchases on the secondary market reduced from October to December to 15 billion euro per month, with the plan expected to be completed by the end of the year. It is estimated that in 2018 new purchases will be made amounting to approximately 33 billion euro and securities maturing will be reinvested amounting to approximately 21 billion euro (estimated on the basis of overall ECB figures applying the capital key). 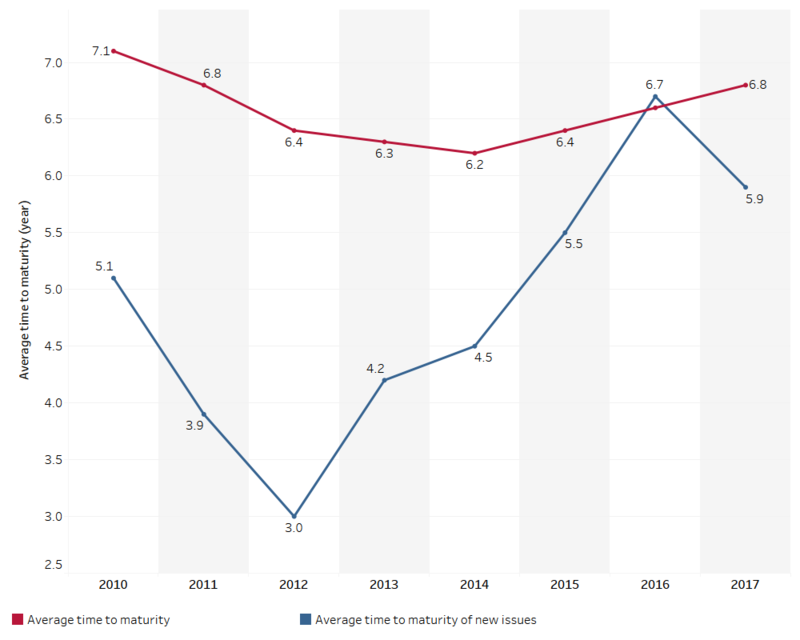 For 2019, the ECB’s purchases of Italian government bonds on the secondary market should concern only the reinvestment of maturities, which we assume to be equal to those of 2018. 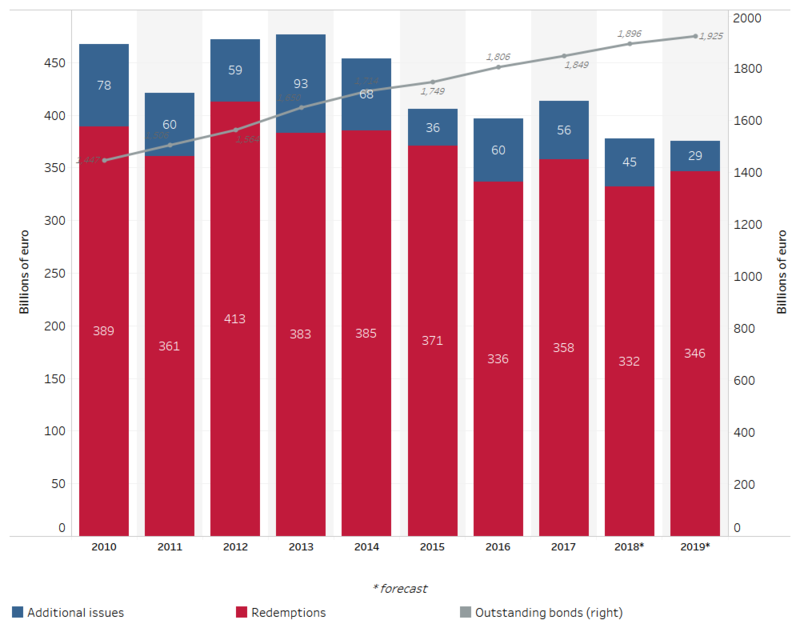 In 2018-2019, the Treasury will issue approximately 380 billion bonds a year. Despite the reduction in refinancing needs (-35 billion compared to 2017), due to the favourable dynamics of the lengthening of security maturities, the expected tapering of the QE leads to an increase in the net private investors purchases of new issues. 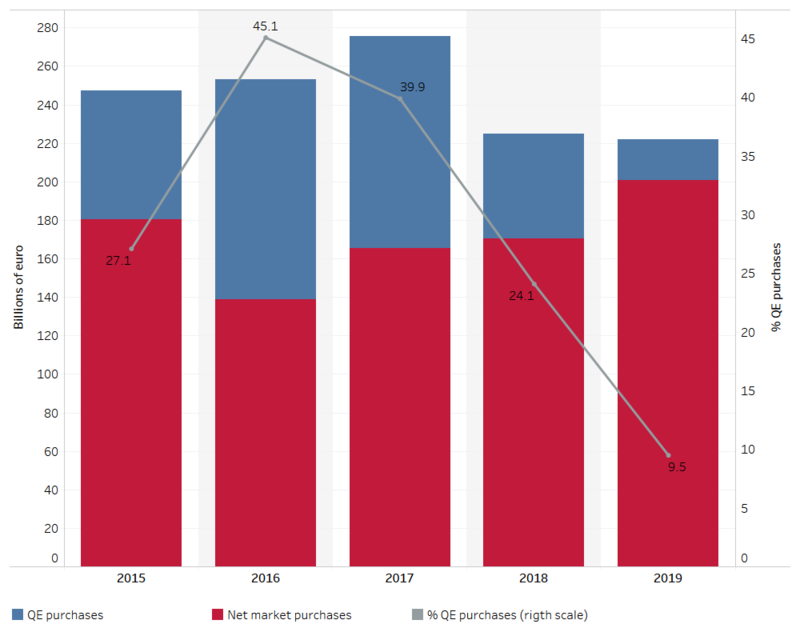 Net of QE transactions, the refinancing of medium/long-term securities through private investors will rise from 165 billion euros of 2017 to 201 billion of 2019.